Although only eighth on a list of the most common cancers, esophageal cancer remains a critical concern that shouldn’t be discounted. In the U.S., white males over the age of 50 are the most likely group to be diagnosed with the disease, but all demographics should be aware of the signs and risk factors that come with it. There are actually two primary types of esophageal cancer. The first is called an adenocarcinoma, which is the most common type in the U.S. and usually occurs in the lower part of the esophagus. The second is squamous cell carcinoma and is normally present near the middle of the esophagus. The risk factors may vary, but the symptoms and dangers remain the same. In the early stages, esophageal cancer does not have many unique symptoms. 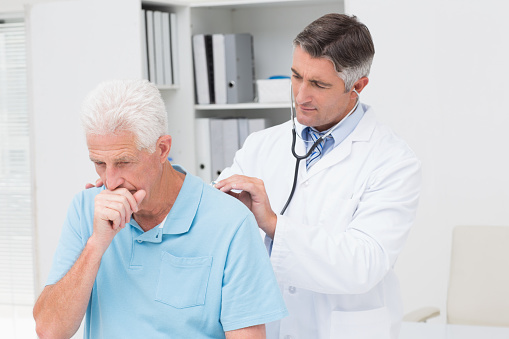 Coughing and hoarseness are common, as is chest pain that may be mistaken for heartburn. As the tumor develops, indigestion and weight loss will occur along with increasing pressure in the chest. The growth may begin to obstruct the passage of food and result in difficulty swallowing. Certain risk factors can also increase your chance of contracting esophageal cancer. The specific risks tend to differ depending on the type of tumor. Squamous-cell carcinoma is more associated with lifestyle-oriented risk factors, such as smoking or chewing tobacco and drinking alcohol. The two, either together or separate, are capable of triggering certain metabolite-related enzyme changes that appear in most squamous-cell patients. These changes are more common in Asia, which partially explains why roughly half of the world’s squamous-cell cases occur in China. Adenocarcinoma is associated more closely with being overweight and gastric reflux. There is actually a specific condition that those with gastric reflux can develop called Barret’s Esophagus. This occurs when exposure to stomach acid causes the tissue in the esophagus to take on properties more commonly seen in the intestines. Barret’s Esophagus has no inherent symptoms of its own, but is considered a significant precancerous condition. First, an endoscopy is performed. An endoscope (basically a hollow tube with a camera on it) is lowered down your throat and used to examine the tissue of the esophagus. If a suspected area is detected, the endoscope can be used to perform a biopsy to get a sample that later gets tested for cancer cells. If a diagnosis is made, treatment options are determined by the stage of cancer you are in. Stages go from one to four in increasing levels of severity. There is also a “stage zero” where cancer cells are detected but no tumor is present. Stage 1: The cancer cells are present in the upper (superficial) part of the esophagus. Stage 2: The cancer has penetrated deeper layers and is at risk of entering the lymph nodes. Stage 3: The cancer has fully permeated the esophageal wall and has entered neighboring tissues and lymph nodes. Stage 4: The cancer has metastasized to other areas in the body. The stage of esophageal cancer largely determines how difficult it is to treat. A patient’s five-year survival rate is more closely affected by how widespread the cancer becomes. The five-year rate for cancers localized to the esophagus is around 40%, the rate for cancers that have lymph node penetration is 21%, and the five-year survival rate when the cancer has spread to other systems is only four percent. It is worth noting that these are estimated rates solely based on prior outcomes—every case is different. Your doctor will know your condition best and can be more informative and accurate about your specific prognosis. Endoscopic surgery: In stage one, when the tumor is smallest, the growth can usually be resolved by the doctor using an endoscope to reach and excise the affected tissue. Esophagectomy: In stage two or three of esophageal cancer, a more advanced procedure may be called for where the affected portions of the esophagus and adjacent lymph nodes are extracted. Esophagogastrectomy: In stage three or four, both the affected portion of the esophagus and neighboring lymph nodes are extracted along with the upper portion of the stomach. The remaining stomach is then ‘pulled’ upwards and attached to the remaining esophagus. Chemotherapy and radiation: As with most other cancers, chemotherapy and radiation can be used to kill cancer cells. Depending on the specific development of a cancer, these treatments can be given on their own, in concert, before surgery (to shrink the tumor and make it operable), or after surgery. Feeding tube: This is not strictly a treatment option, but in cases where the cancer is presenting a significant throat obstruction, a feeding tube may be needed to ensure you get proper nutrition until the tumor can be dealt with. Although there are no alternative treatments for the cancer itself, alternative treatments can be helpful in alleviating symptoms of the disease or side-effects from chemotherapy and radiation treatment. Acupuncture, massage therapy, and meditative relaxation techniques have all been found to make coping with esophageal cancer easier and should be considered if you are struggling to manage your symptoms. In terms of preventing or otherwise reducing your risk factors for esophageal cancer, many options are available. A diet with a regular amount of fruits and vegetables, a healthy weight, abstinence or moderation of alcohol, and quitting smoking are all capable of reducing your risk of esophageal cancer. Plus, you’ll be healthier overall! “Barrett’s Esophagus: Symptoms, Causes, and Treatments,” WebMD web site, http://www.webmd.com/heartburn-gerd/guide/barretts-esophagus-symptoms-causes-and-treatments, last accessed July 22, 2015. “Esophageal Cancer,” Mayo Clinic.org, http://www.mayoclinic.org/diseases-conditions/esophageal-cancer/basics/symptoms/con-20034316, last accessed July 22, 2015. Jaslow, R., “Woman Reportedly Coughs up Cancerous Tumor,” CBS News web site, January 12, 2012; http://www.cbsnews.com/news/woman-reportedly-coughs-up-cancerous-tumor/. Pennathur, A., et al., “Oesophageal carcinoma,” The Lancet 2013; 381(9864): 400-412. “Survival Rates for Cancer of the Esophagus by Stage,” Cancer.org, http://www.cancer.org/cancer/esophaguscancer/detailedguide/esophagus-cancer-survival-rates, last accessed July 22, 2015.